Last June, we spent the Independence Day holiday over at the Bicol Region. It’s one of the largest portion of Luzon and is also a good vacation stop-over. I’ll blog about our trip on a separate post so I can share some of our photos. 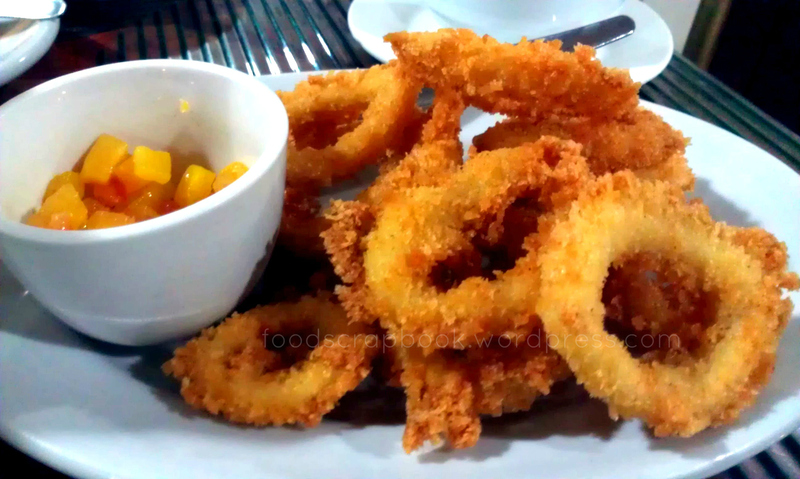 When you are in Bicol, the first thing that comes to your mind is FOODTRIP! 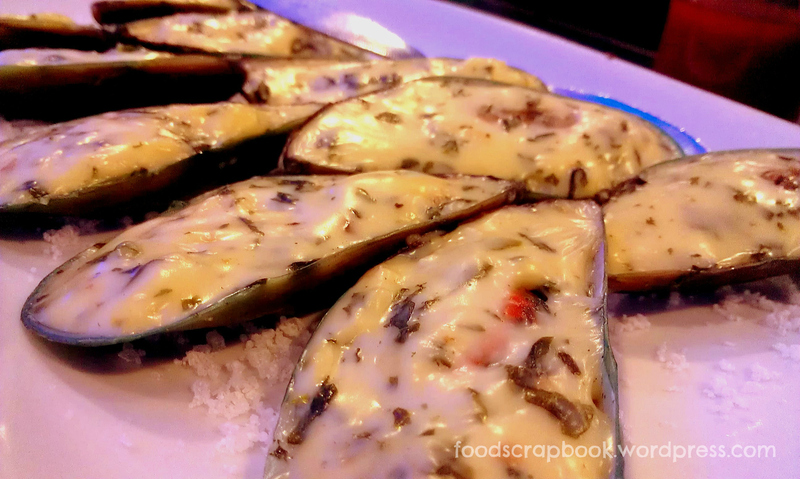 Perhaps it has been a staple for Filipinos to treat most of our vacations in several tourist spots into an awesome food trip session. 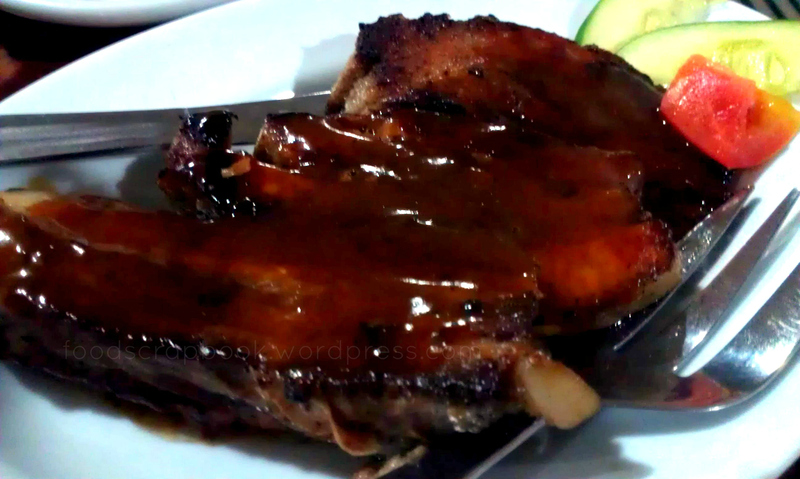 One of the best restaurants that we visited in Legazpi City was the infamous 1st Colonial Grill Restaurant. We just came from a day of touring Sorsogon so we were super hungry that we ordered for a big group whereas we were only three. Talk about MAJOR Hunger. I’ll narrow it down to the amazing stuff that we ordered that night and let the food speak for itself.. 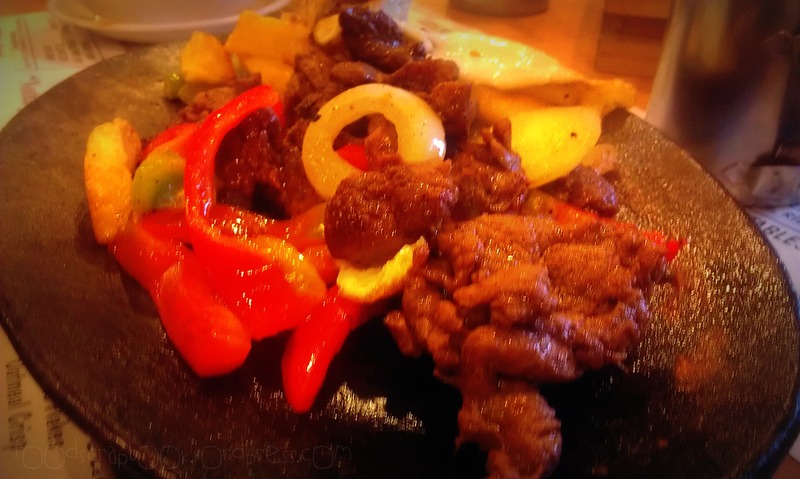 This one’s spicy (of course) but there’s nothing really special about the flavor. 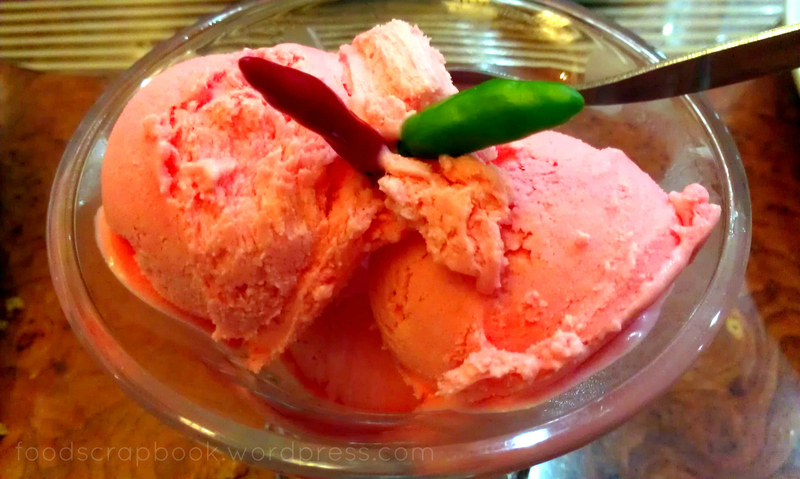 You could easily imagine that it would be a good local version of the Chili Italian Gelato but nope, it’s just a bit creamy but it lacks flavor. 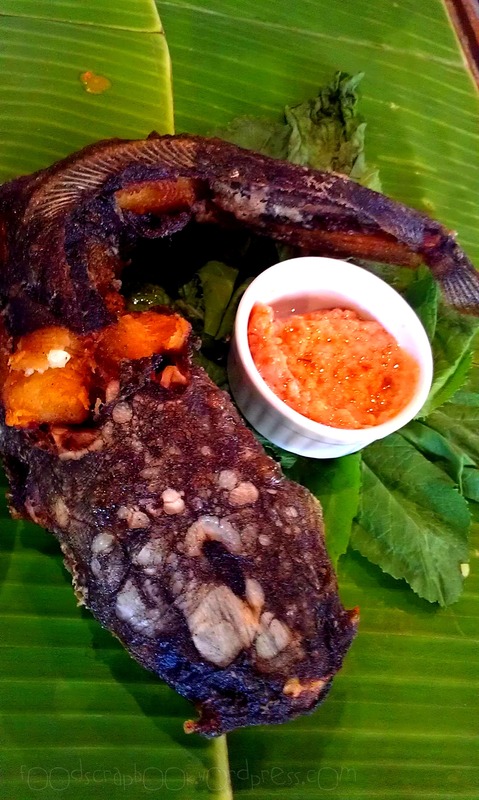 The food was all in all amazing and it really accentuated the goodness of local Bicolano cooking. We loved every bit of food we ordered here on top of the huge appetite that we had that day. Good Job Colonial Grill! The service was okay since the crew were very nice and accommodating. The restaurant itself also has a good ambiance. 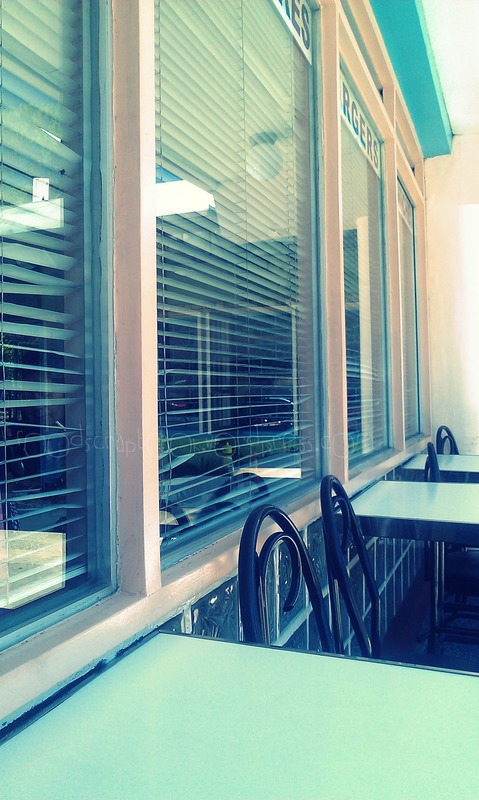 Beside the restaurant was Bicol Blends Cafe. Too bad we weren’t able to try it because they closed earlier than usual that night. It was the perfect ending to a tiring day. 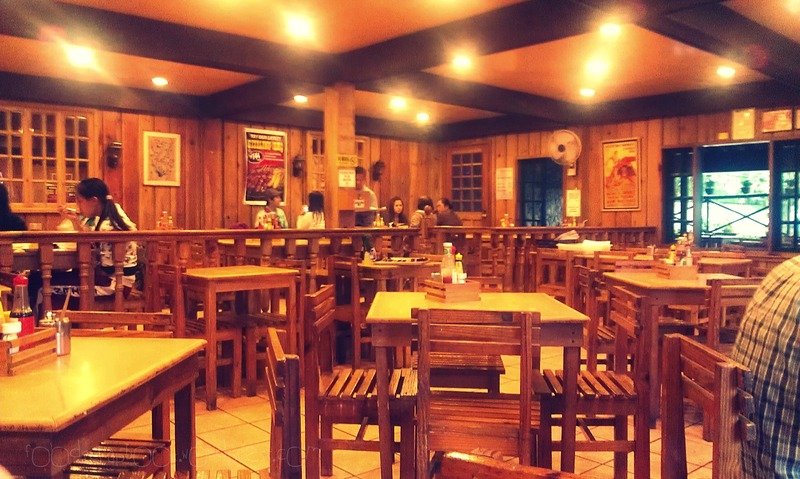 We’ll surely come back to this restaurant when we’re in Bicol again. Been such a long time, I know. A thousand apologies! I don’t want to blab about my excuse for not having time to blog and just go straight to my quick post <raise eyebrows..>. We ordered quite a lot considering we were just 2, but we missed it so much we wanted to order all the usual! 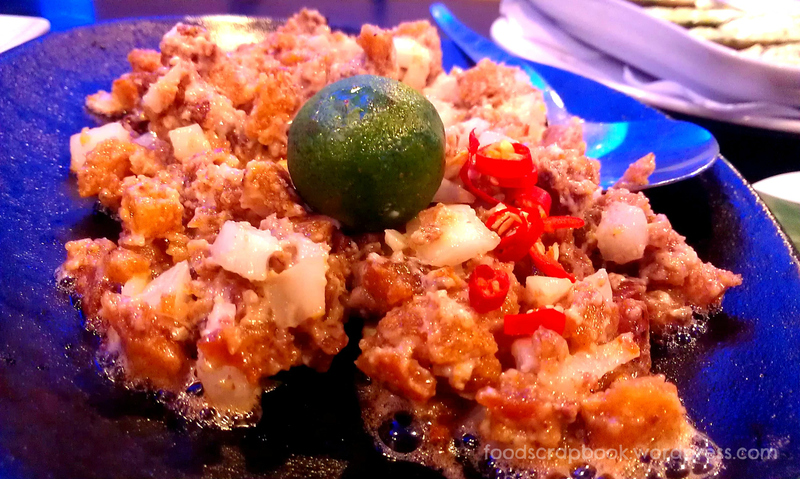 Pork Sisig – of course! 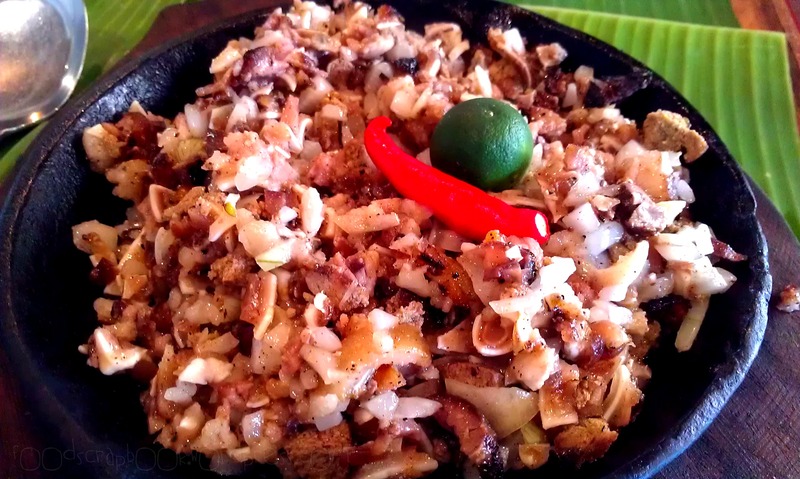 When you go to a Grill, Sisig is simply a default order. Best with Rice and Egg or as Beer-mate. The BEST! 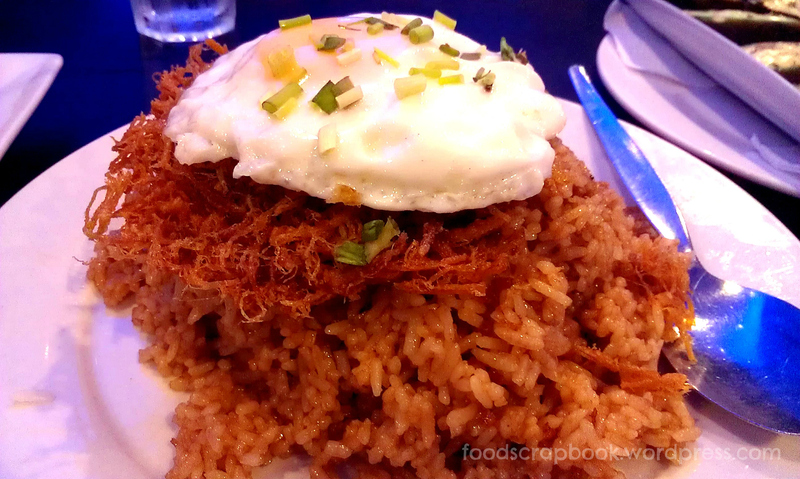 I must say, Flakes palang ulam na! You may check out their menu here or in their website. 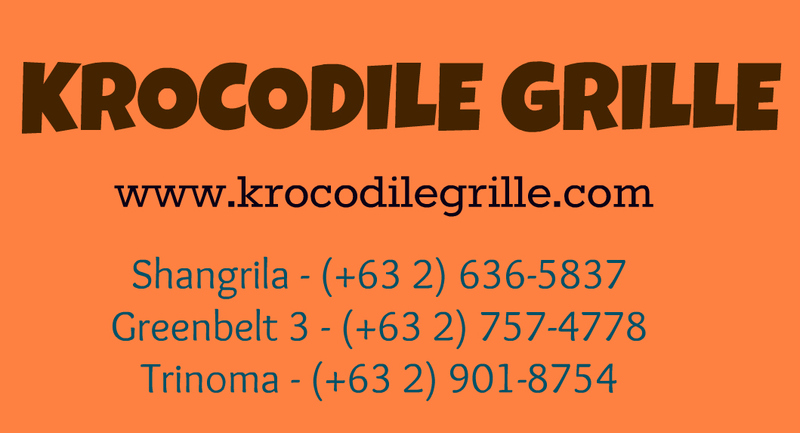 Krocodile Grille is mission accomplished again as it did not fail to make us so stuffed and heavy but happy! <burp> Busog! Zaifu has been in Powerplant Mall eversince I can remember. 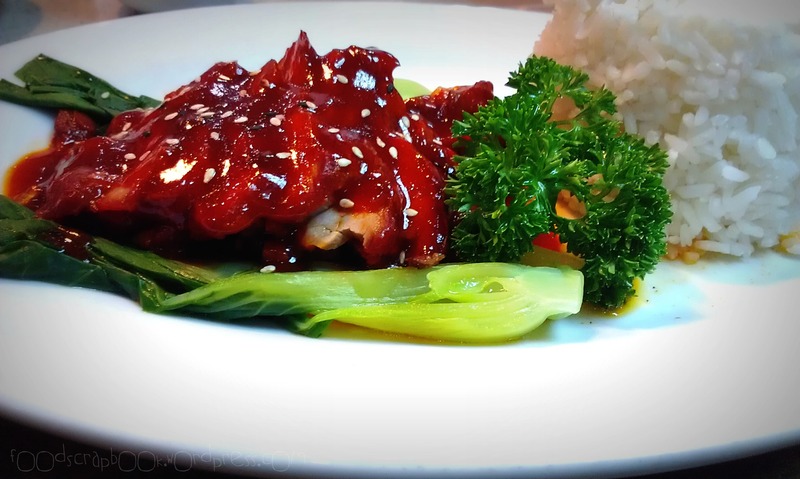 It’s one of the good restaurants that you can find in the lower ground area of the mall. 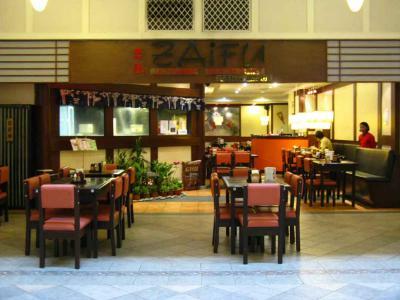 It has been ages since we’ve been going to this mall and only once or twice did I try Zaifu (no reason behind it). 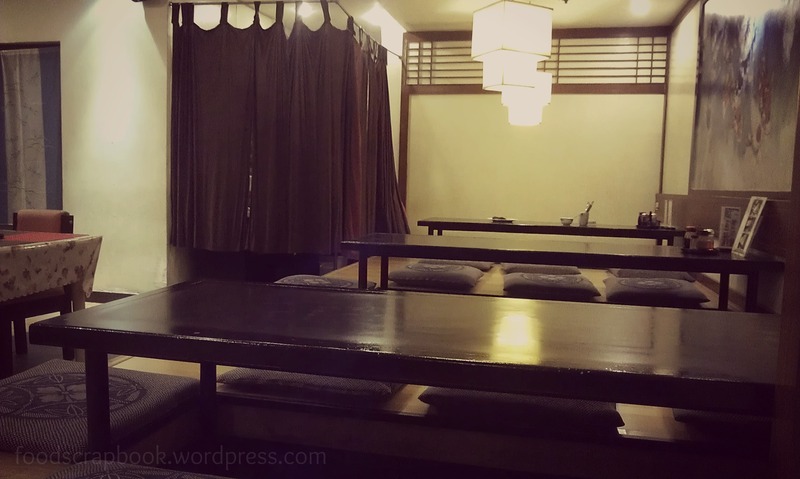 The interior looks just like your regular Japanese restaurants with upholstered chairs and Japanese style dining set where you can “Indian Sit” or just relax your foot underneath the table (yes, there’s legroom in there). It was also quite comfy and relaxing. I ordered the typical, Katsudon, because I was really craving for it at that time. This Don Buri costs P185.00. Pretty expensive for a regular tasting Katsudon. 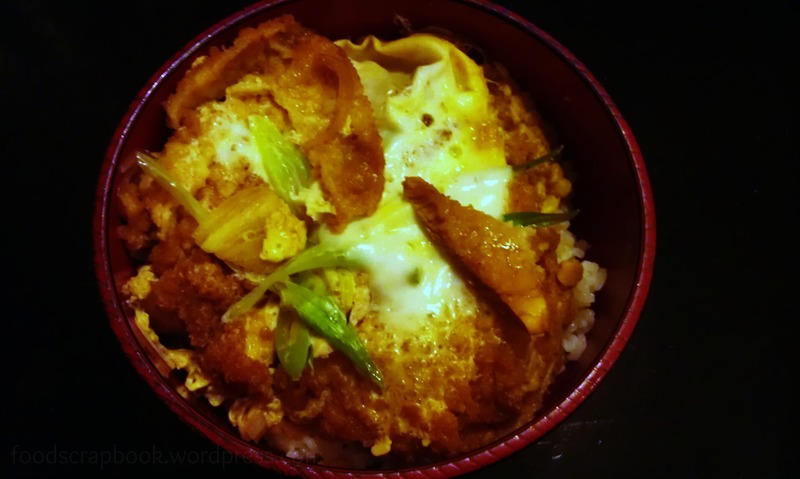 I bet there are more Japanese Restaurants that serve better Katsudon. Verdict: not bad! 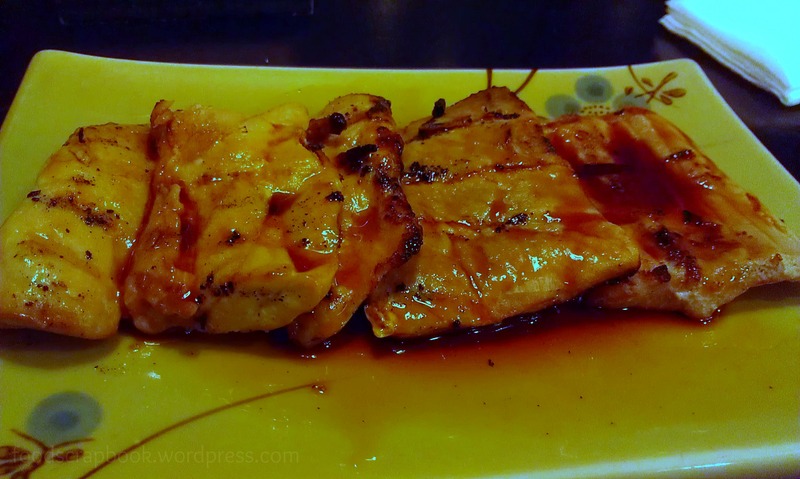 We also got the Tuna Teriyaki (ala carte) and it costs P205.00. It was kinda bland and somehow underseasoned so we didn’t like it that much. 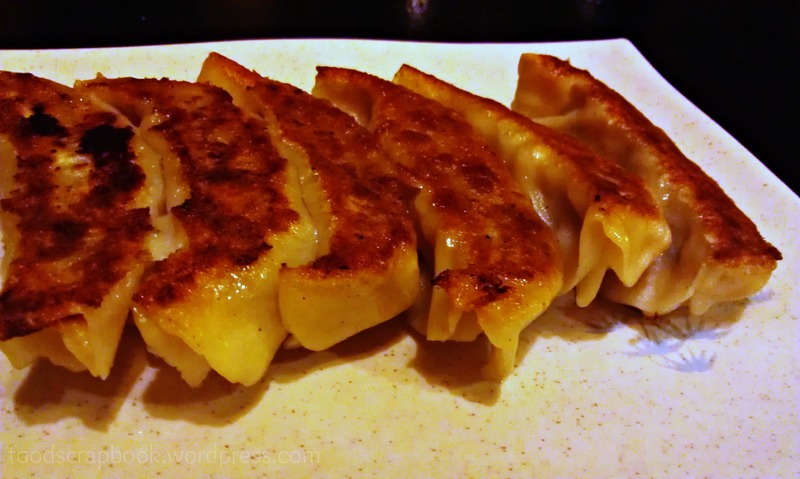 And lastly, we couldn’t let it go without ordering Gyoza! This costs P169.00 for 6 pieces which is also pretty expensive. You can get quality Gyoza from Teriyaki Boy for only about P100.00++. Their Gyoza tasted okay but it was a little over-steamed as the wrapper keeps falling apart. I guess the best thing here is that they also have a mini grocery that sells Korean Ice Cream products (Binggrae!). 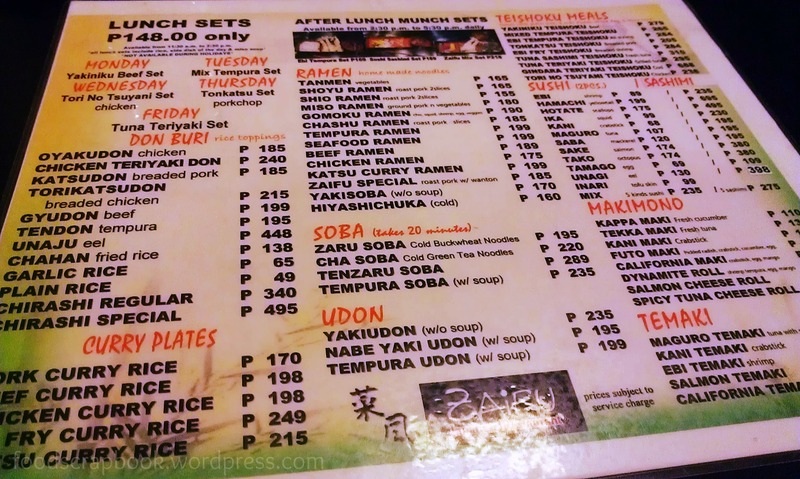 With the wide array of choices in their menu, they might have specialties in other areas like Ramen, Tempura, etc so it could also be a great idea to try them out. Sorry for the backlog, I’ve been super busy with work lately. Everyone’s just rushing to finish stuff before the Loooong weekend due to the Holy Week and Easter Weekend. 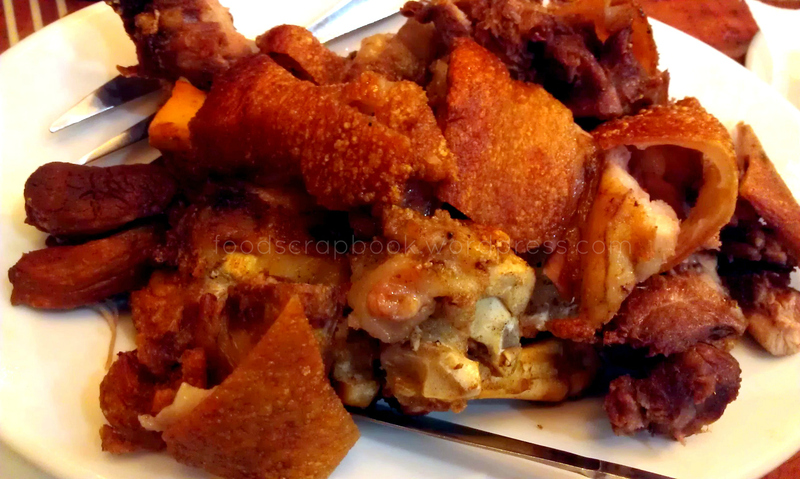 Anyway, I’ll be sharing the last of the Baguio foodscapade that we had last February. 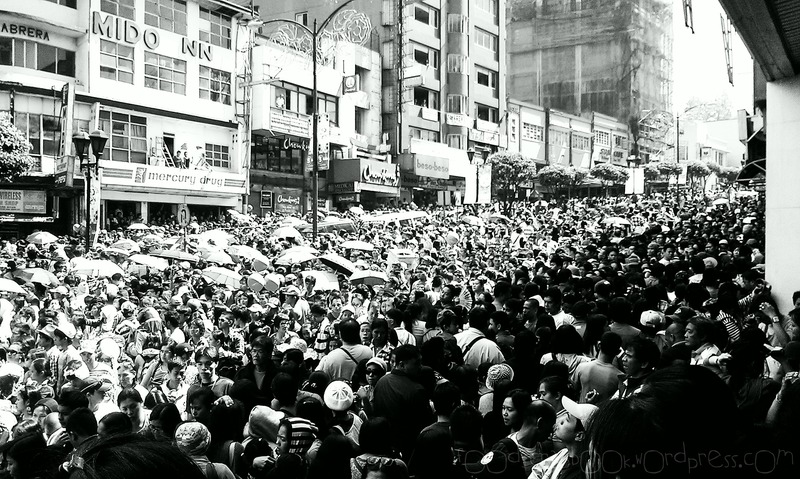 That day was so tiring because we started the day too early to catch the festival’s famous street dance parade. We skipped lunch time to take a nap and decided to go for Cafe by the Ruins in the afternoon. 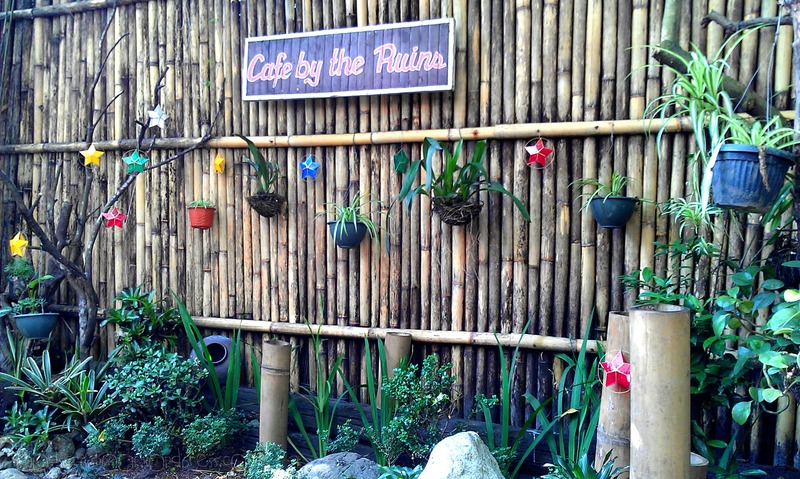 Cafe by the Ruins is well known in Baguio to serve the finest local ingredients into their healthy and mostly vegetarian dishes. 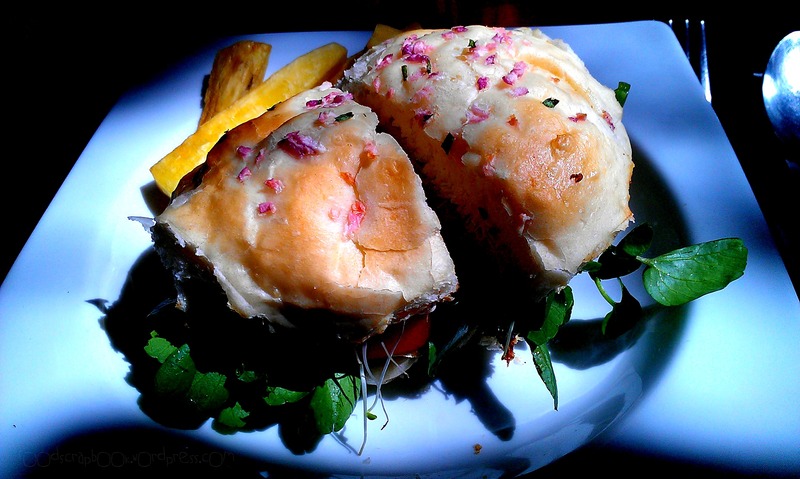 Some of their dishes introduce organic products which makes this cafe perfect for health conscious foodies. 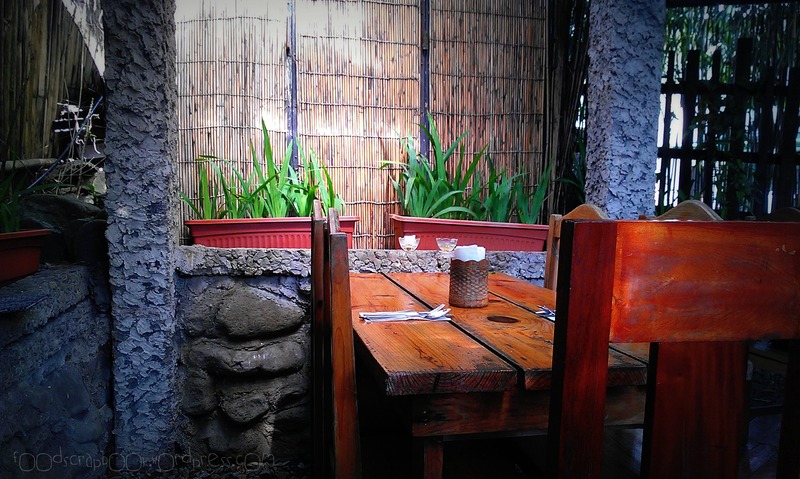 The place has a great ambiance because of their wooden decor and furniture as well as the nature-feel interior. This here is the waiting area slash bakeshop where they sell their fresh pastries, coffee beans, as well as other organic products. 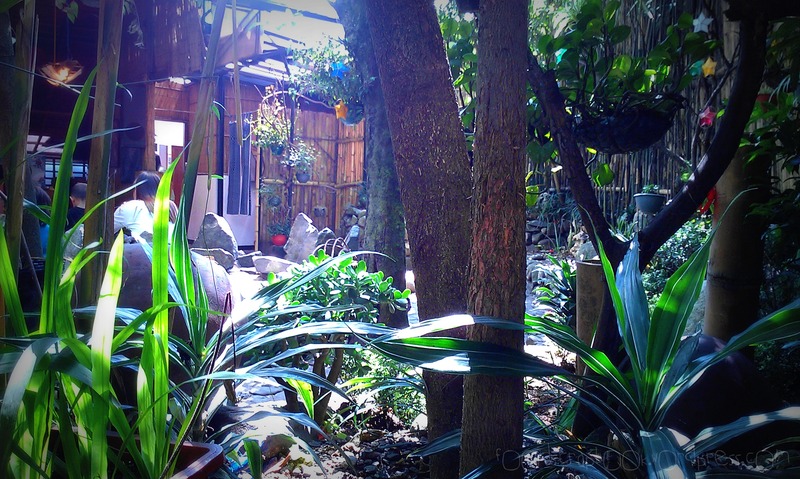 Inside, you’ll be greeted by the soft breeze and the plants that make it look relaxing. Their tables and chairs are made up of wooden materials. The menu showcases a small selection of pastries, vegetarian meals, salads, rice meals, desserts, and strawberry delicacies. 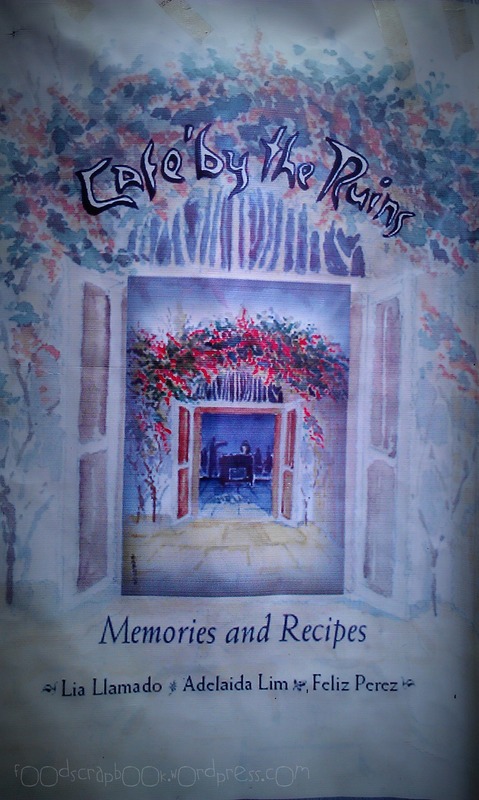 (side comment: you’ll notice that the pages of the menu smells like pages from an old book). What we had that afternoon was just right and not too filling. We ordered their bestseller sandwich, the Cheeseburger and paired it with a simple Pasta Carbonara. 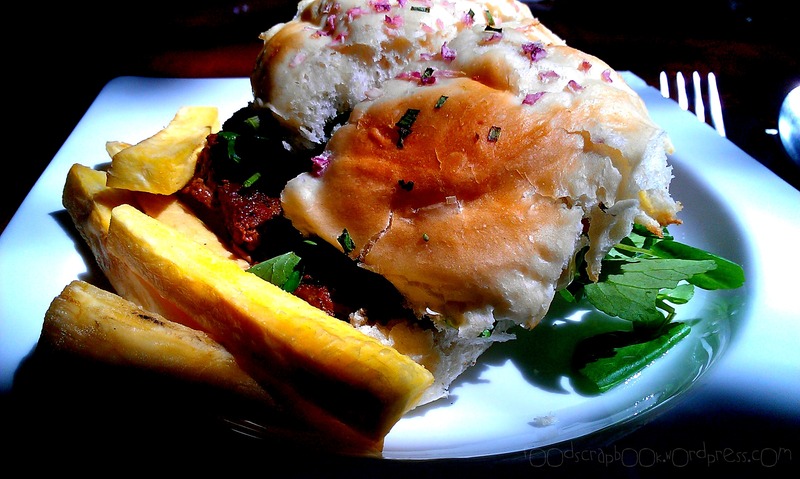 We absolutely loved this one because it’s a different approach to your favorite cheeseburger. 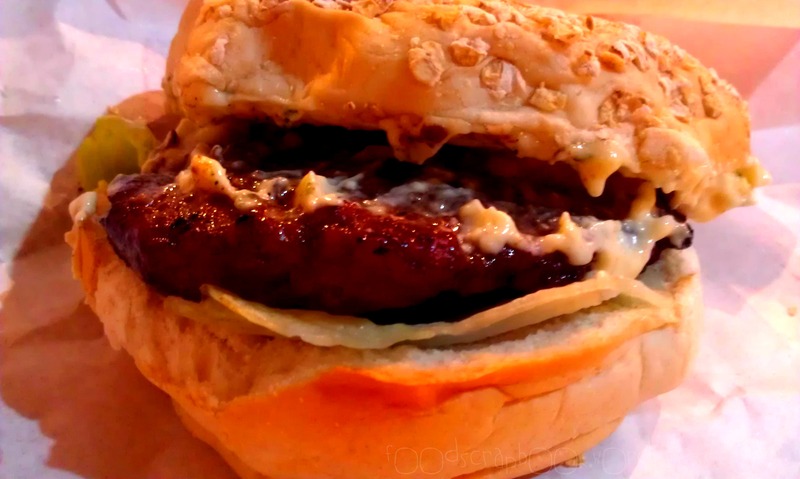 Instead of the normal cucumber and lettuce, they used some of the fresh herbs that are grown in Baguio, tomatoes, and their very own burger buns. 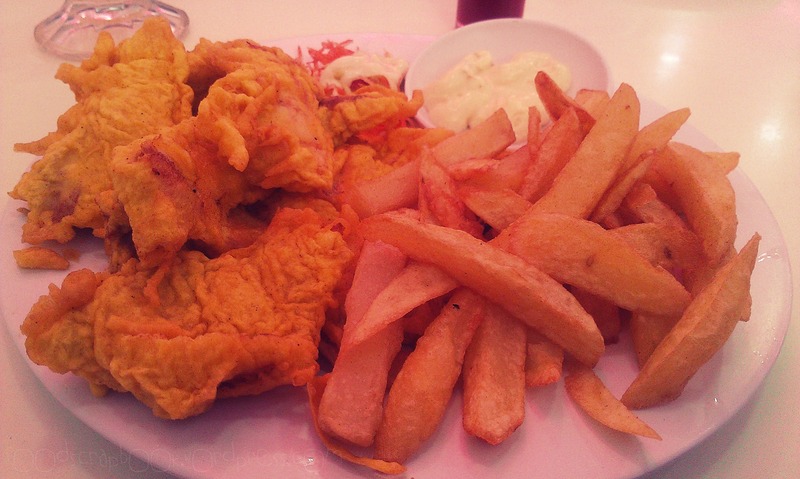 This was served with Cassava Fries (Kamoteng Kahoy) instead of the normal French Fries. We really enjoyed this one, not bad for P120.00. This here is their Pasta Carbonara. 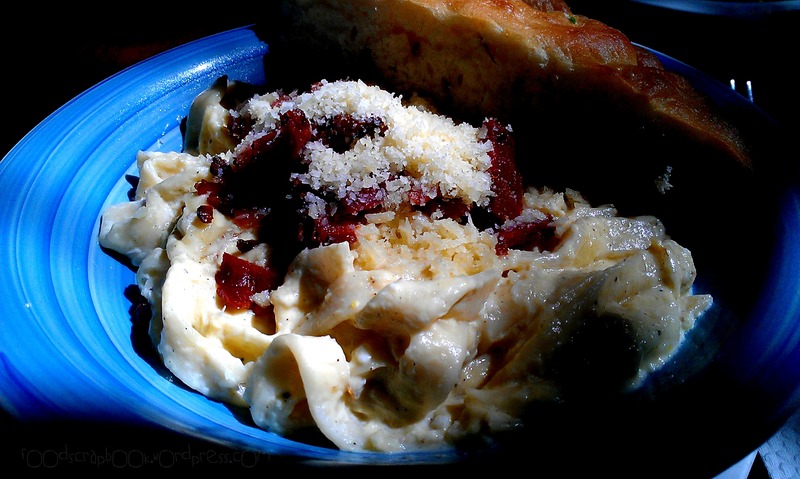 This was simply cooked like any good Carbonara dish topped with bacon bits and parmesan cheese. It had a strange garlic bread on the side that we didn’t manage to finish up because it was too heavy on the stomach already. 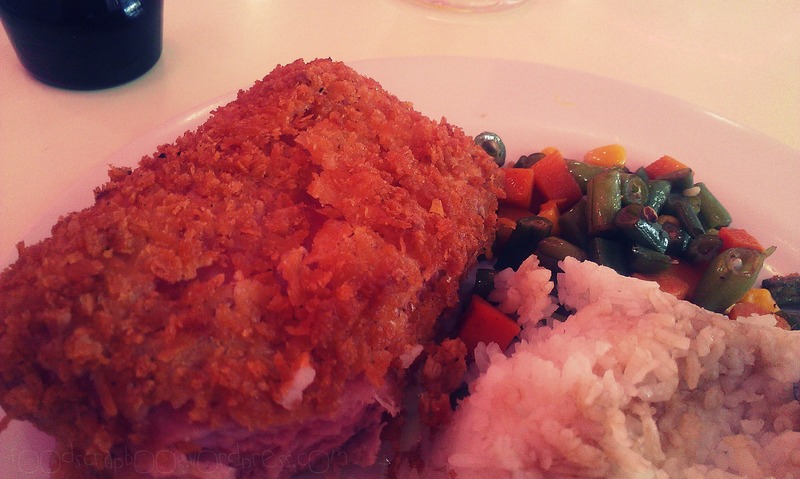 This too was good and it cost P220.00. All in all we had an OK time at this cafe. Value for money is good in our case because we ordered the cheapest ones from their menu. This was our second time here and the first one wasn’t really all that pleasant since some of the prices are steep. We ordered expensive food and it was not 100% worth it. This time around it was fair enough because we enjoyed what we had. In terms of customer service, I’d rate this poorly because most of their waiters are not that friendly and they also serve food quite slow. I hope they work on this soon so that customers would have a good overall experience. I won’t be really psyched to come back here the next time we’re in Baguio. I do love the look of this cafe. It gives you a feel-good vibe that makes you relax in some way. 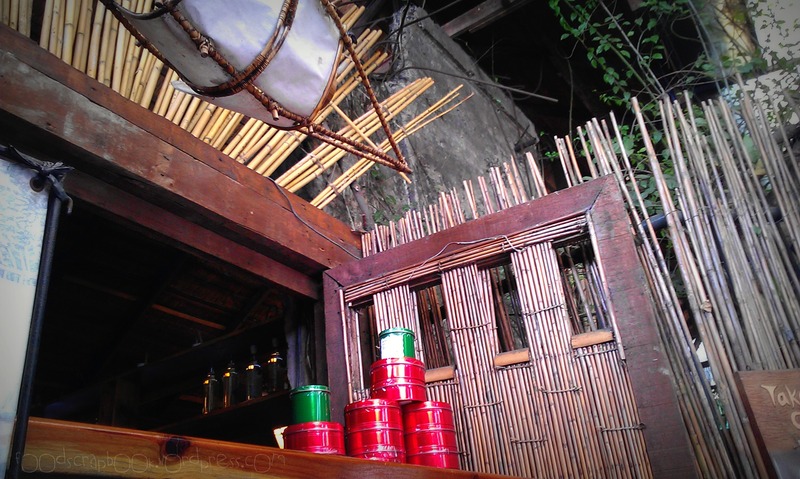 Given that Baguio weather is already comfy, Cafe by the Ruins gives it a different spin. What’s the first thing that comes to your mind when you hear about eating on banana leaves? 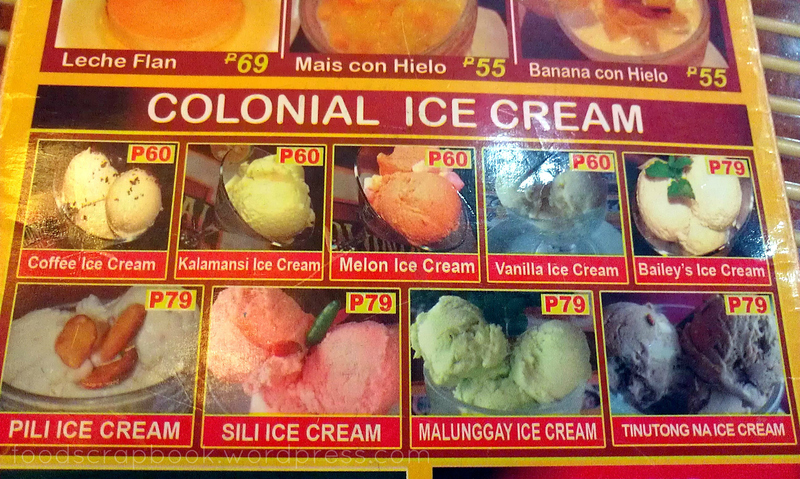 For Filipinos, it would be wow, SARAP (delicious)! 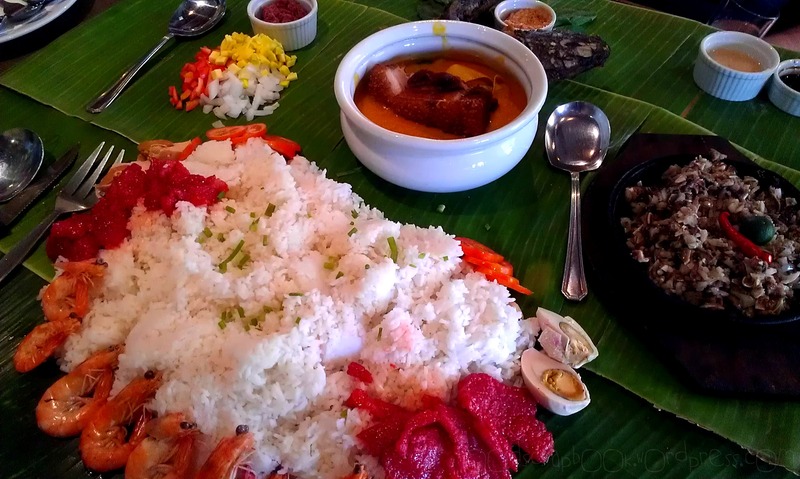 As an old yet well-loved Filipino tradition, eating on banana leaves has been one of the best ways to enjoy our scrumptious native dishes. May it be on the beach, on a hike trip, a picnic, or any other group gathering, eating on banana leaves is truly the BEST! 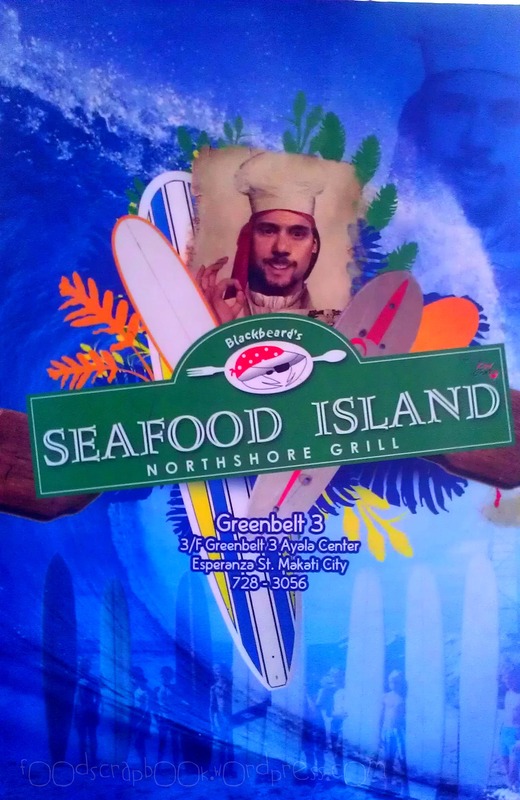 A great idea that Blackbeard’s Seafood Island has adopted into their famous line of seafood restaurants. 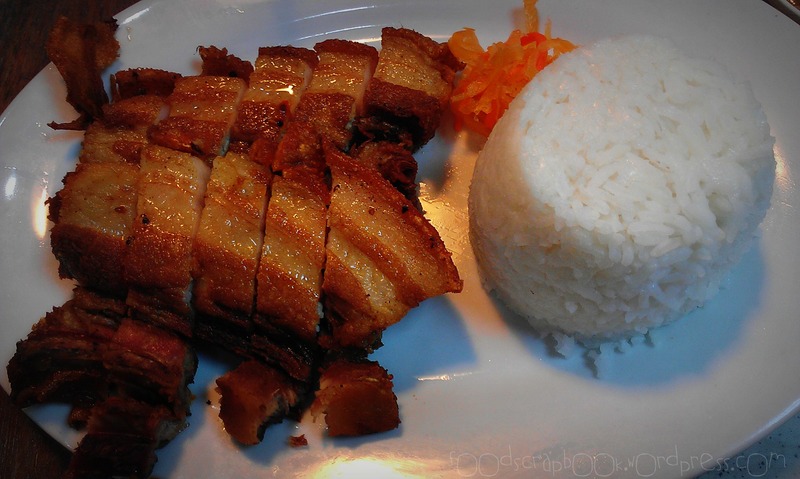 Pork Tocino (Sweetened Cured Pork), Steamed Shrimps, Salted Egg with Tomatoes, Kare-kareng Gulay (Vegetable in Sate Sauce) with Crispy Lechon Kawali (Deep Fried Pork Belly), Crispy Fried Hito (Catfish), Pork Sisig, Ensalatang Mangga (Green Mango Salad), and Tons of Plain Rice. 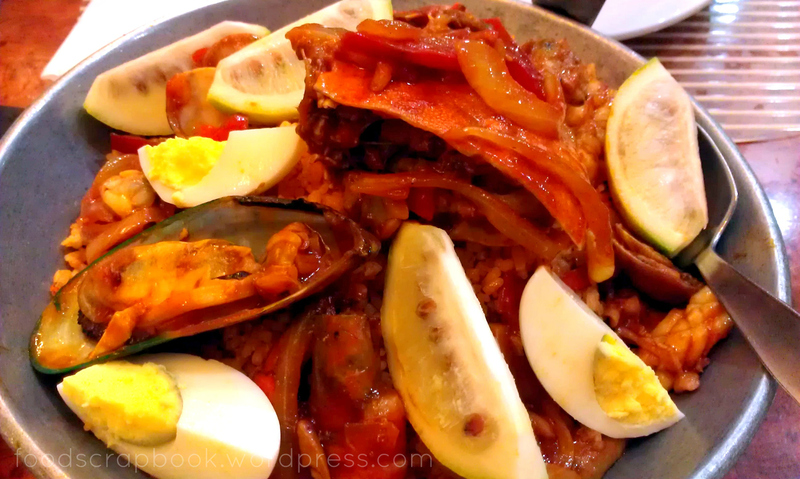 Shrimps, Pork Tocino, Egg, and RICE! Now that’s what you call a FEAST! 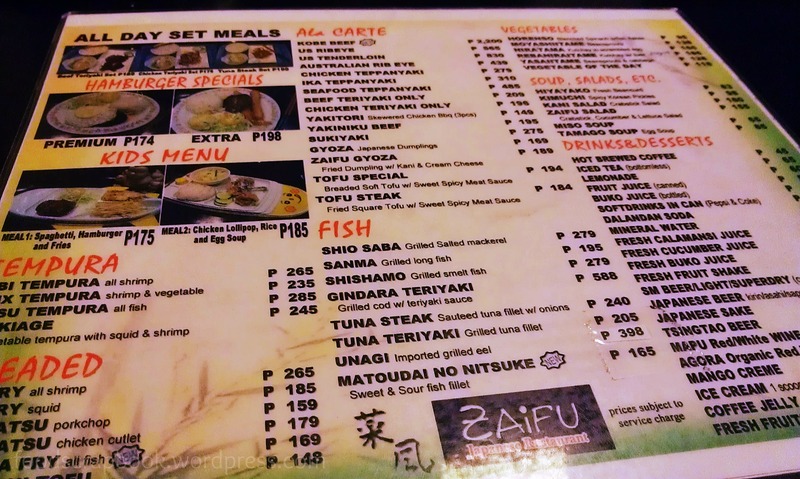 What we ordered was good for 5-6 Persons and it costs only 1,250 Pesos. What a good catch! 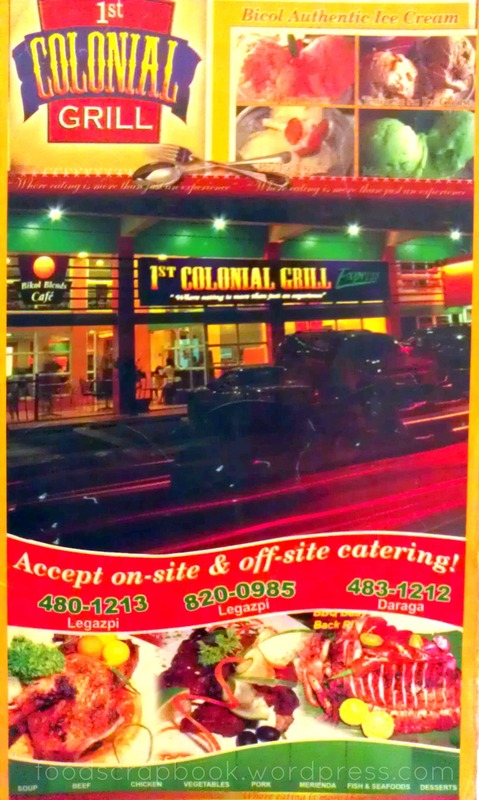 The best way to go is to eat with your hands (all the way Pinoy!) but since you’re served with utensils then there’s nothing wrong if you want to stay clean and hygienic. 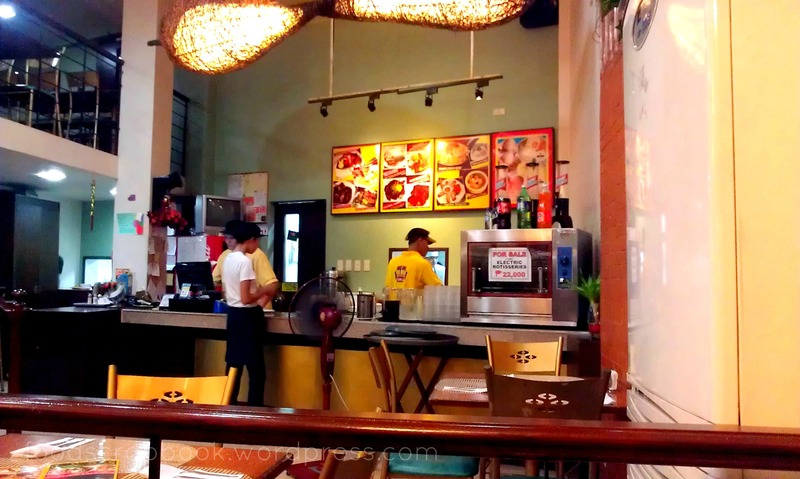 Seafood Island also has this pirate-y theme and a cozy interior to get your appetite kickin! 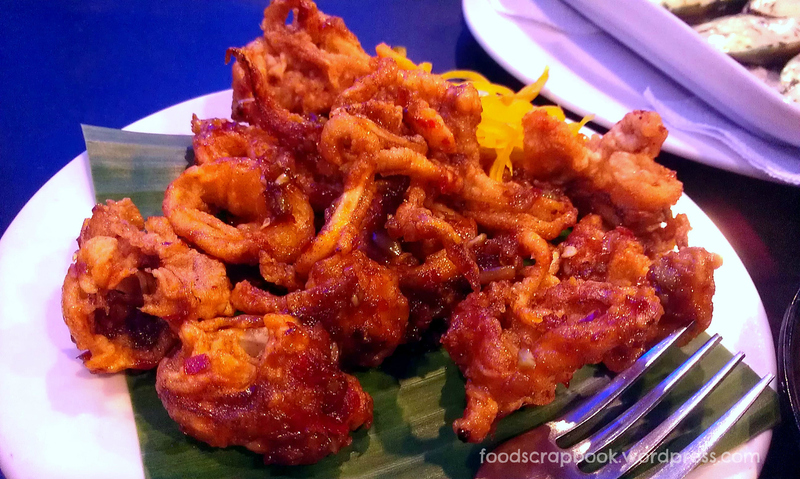 They also have such a bubbly menu with lots and lots of mouth watering dishes to choose from. 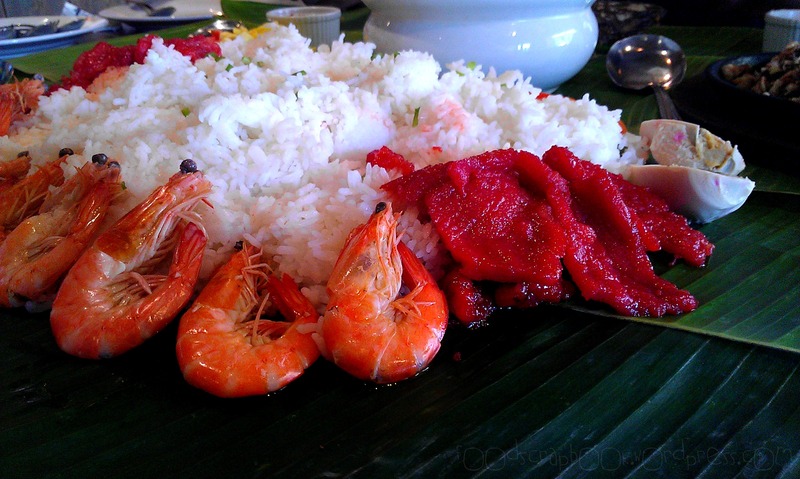 Take time to weigh in your decisions when you’re choosing the best Boodle Feast for you and your friends or family. 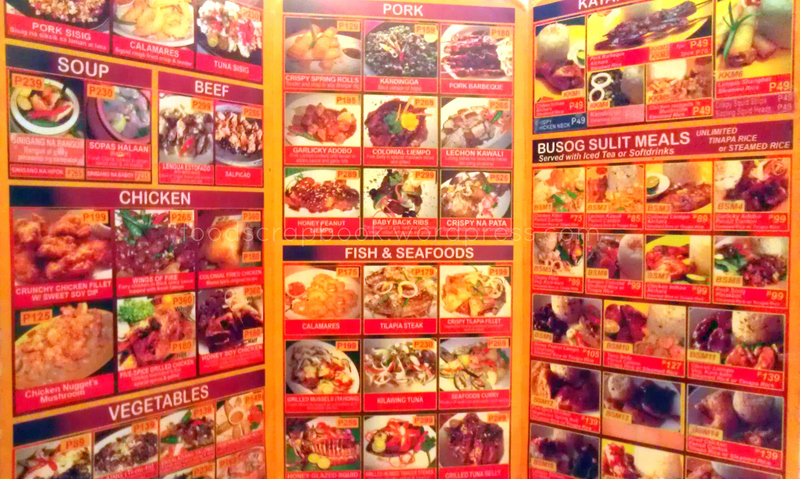 Trust me, you have too many choices and everything looks so good! 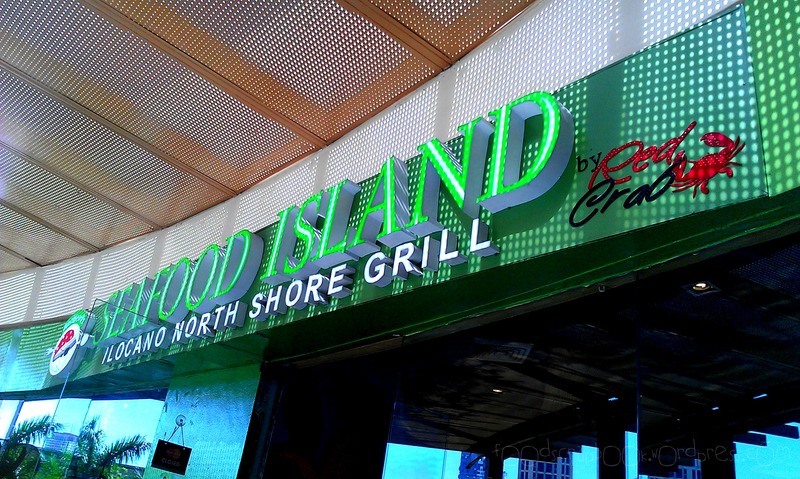 Blackbeard’s Seafood Island is owned and managed by the Red Crab Group of Restaurants. Be on the know of their updates and promos via their Facebook Page. 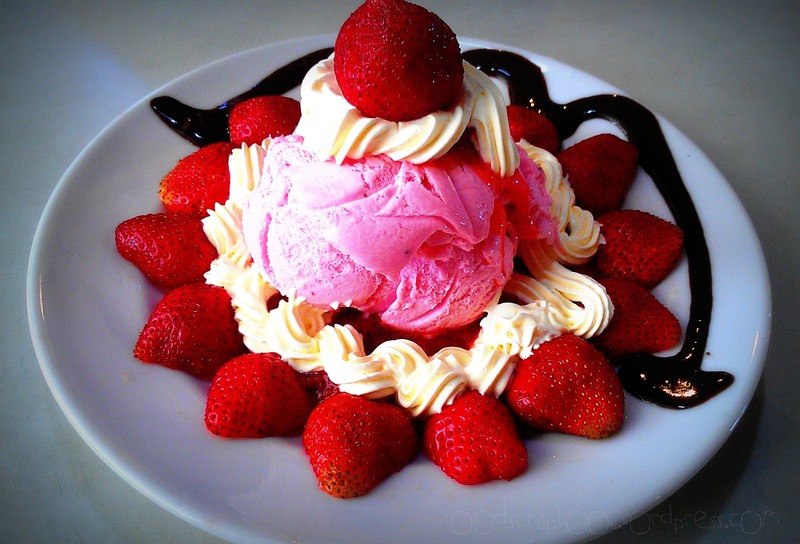 Nothing much to say here and just ogle at the sight of this..
Strawberries are in season and it made this combination to die for. I just can’t get enough! 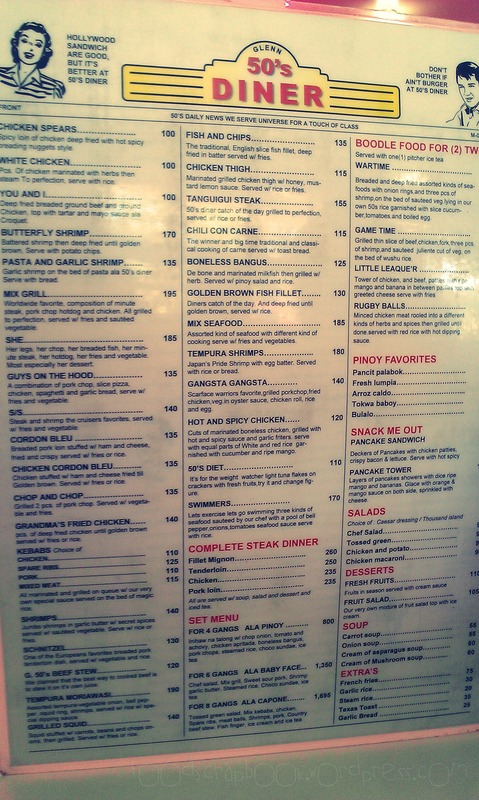 At 190 Pesos, you won’t go wrong (as I always say :)). 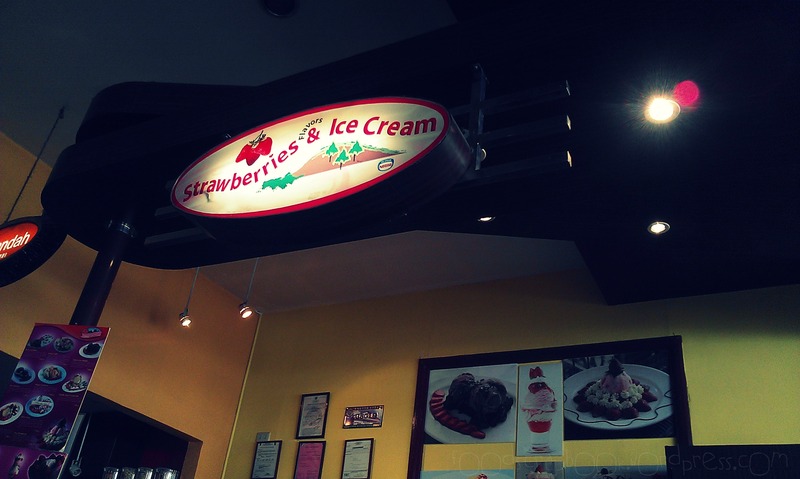 You can have the Very Strawberry Ice Cream at Strawberries & Ice Cream – Filling Station, Camp John Hay. I feel really bad that this amazing restaurant was only our second choice that night because our first pick was full (jam-packed!). I just want to smack myself for judging the place by the way it looks and the amount of people dining. Don’t get me wrong, there were lots of people too but it’s nothing compared to the “first pick” where people were actually banned to step inside. I just thought about what my dad use to say, you’ll know a restaurant is good if there are many people dining in. 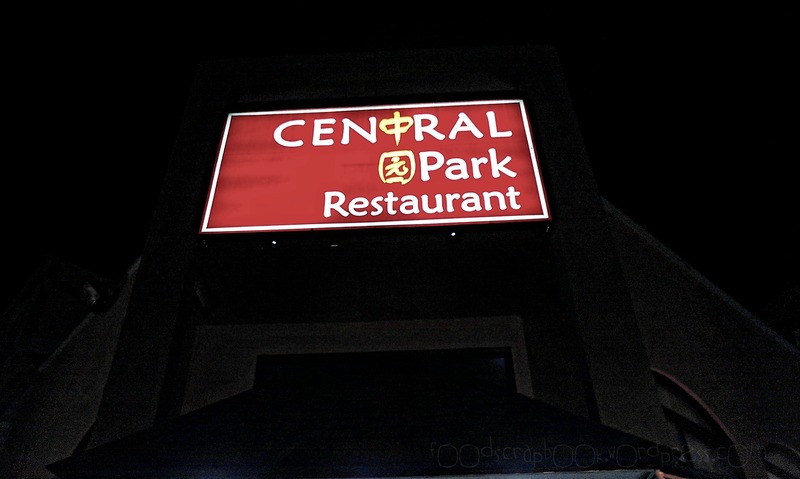 In Central Park Restaurant‘s case, there’s a huge exception to that rule. The service crew were very friendly and accommodating which is also why we were convinced to dine here. Considering the amount of people dining in, their service was good and quite fast. We got our orders in less than 15 minutes time. 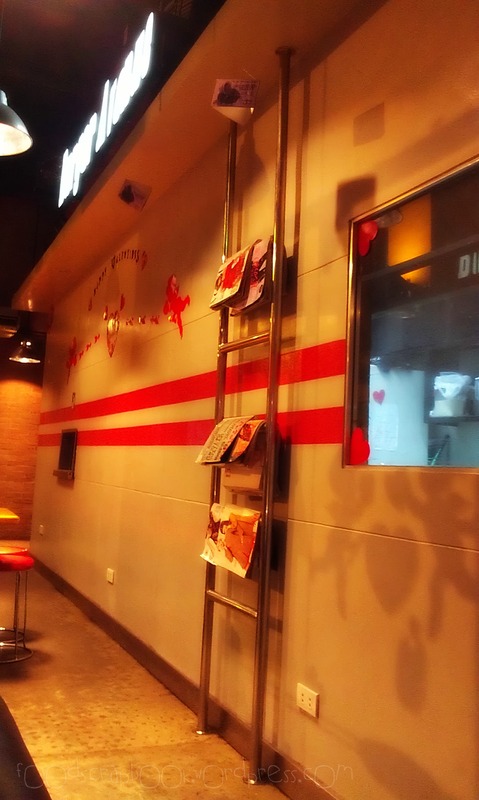 Talk about a true Chinese fastfood experience! We were pleased with the good start, and the free hot tea that they served. But we were happier when we got to taste their food. 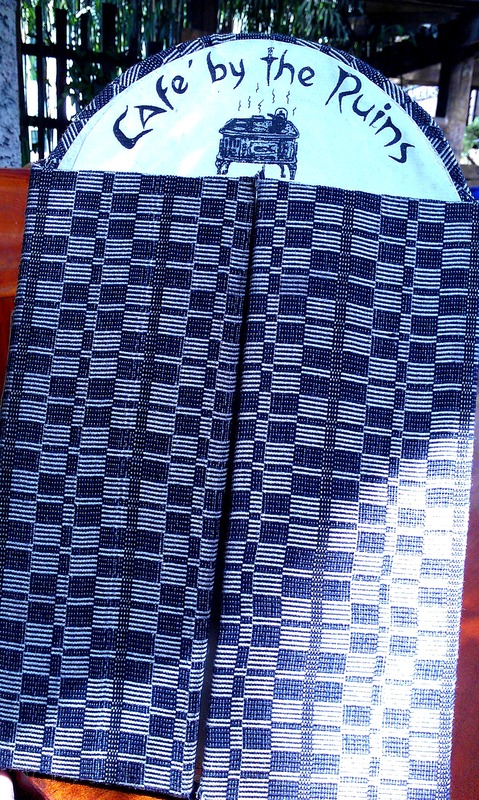 Here’s what we had..
Ok, sorry, I totally forgot what this one was called. They did name it after their restaurant but I’m not sure about that ‘Special Dimsum’ part. Anyway, I thought about it because this one is really special. 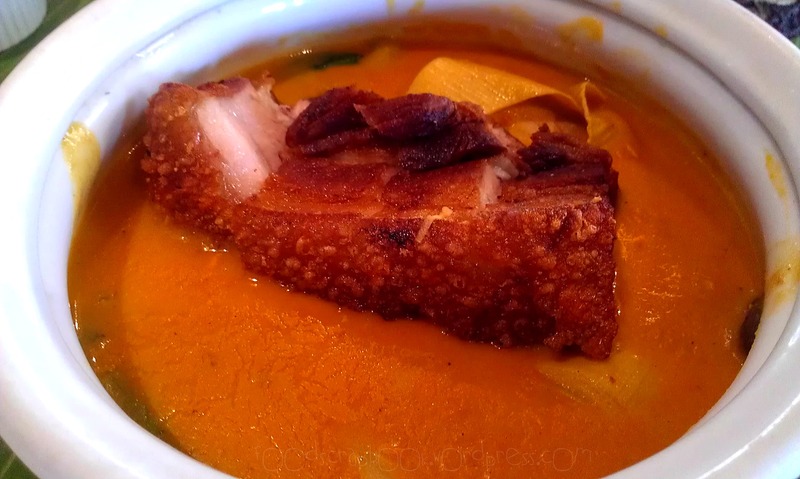 It’s such a different way to serve pork dumplings. 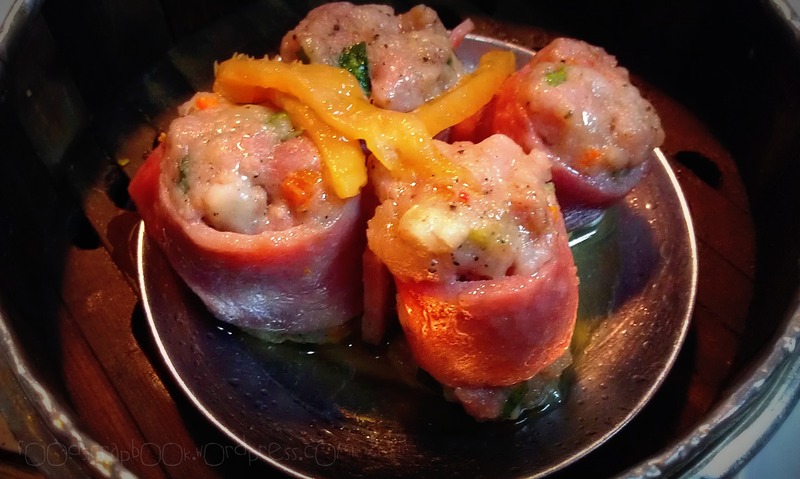 It consists of the usual pork dumpling mixture with different varieties of vegetables and spices to make it unique. 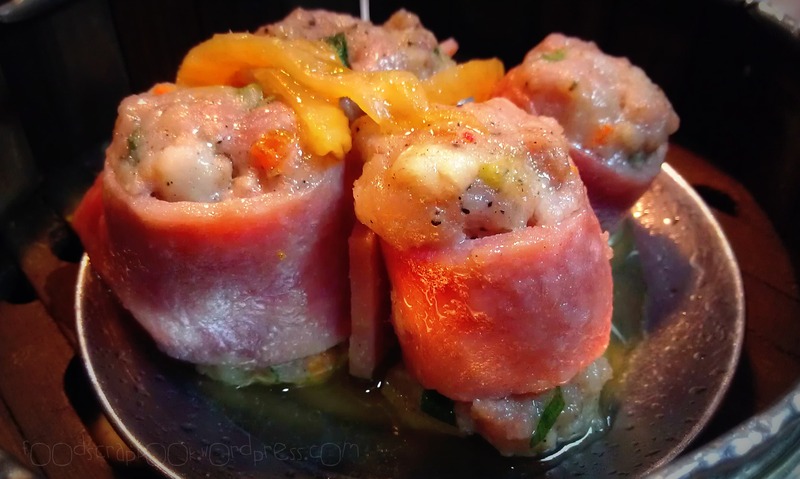 What’s odd is that instead of the usual dumpling wrapper, they used ham to wrap the dumpling meat up. They also have the same version except they used bacon as wrapper. It’s a great idea to give your homemade dumplings a new twist. The interior looks nice with this huge wall art. Everyday Fresh! The place was quite small but it was enough to accommodate hungry tourists and visitors. 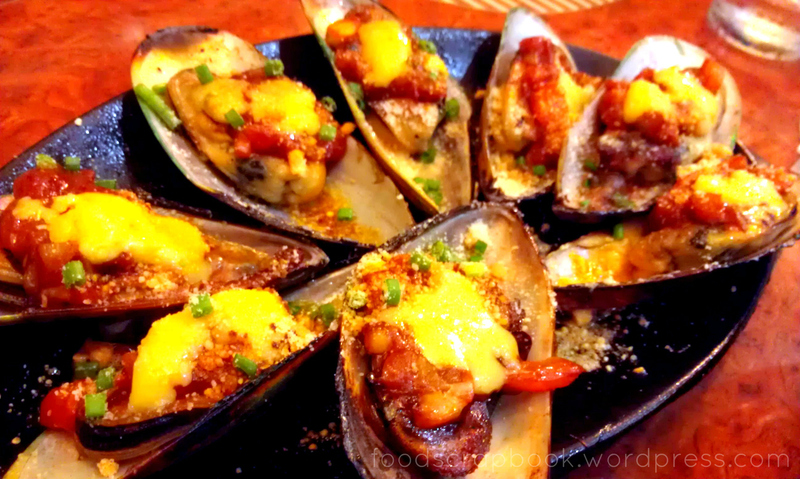 We’d definitely go back here when we’re in Baguio again and I hope you guys try it out too! Nothing Beats Their Old Sizzle! 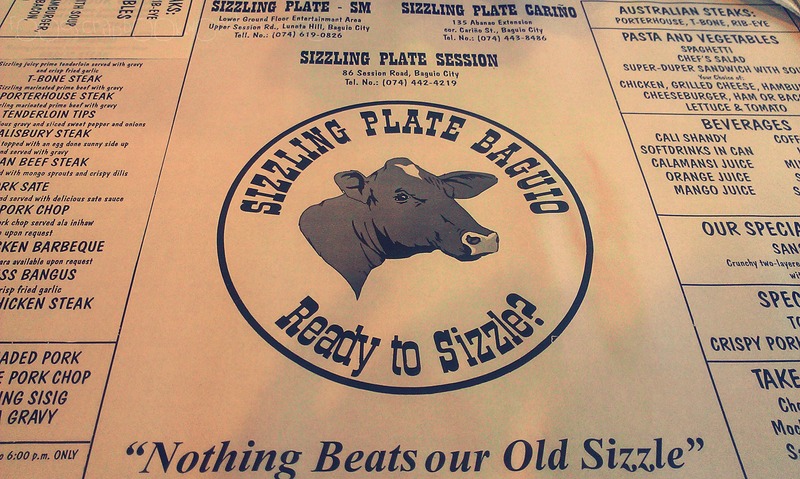 Going back to Sizzling Plate Baguio was very heartwarming since we did really miss the food here. We came a bit early for dinner that’s why there were only a few people. The wooden interior gives a good western-ish theme to the place and it keeps it kinda warm given the chilly weather outside. People started piling up minute after minute until it was actually dinner time. 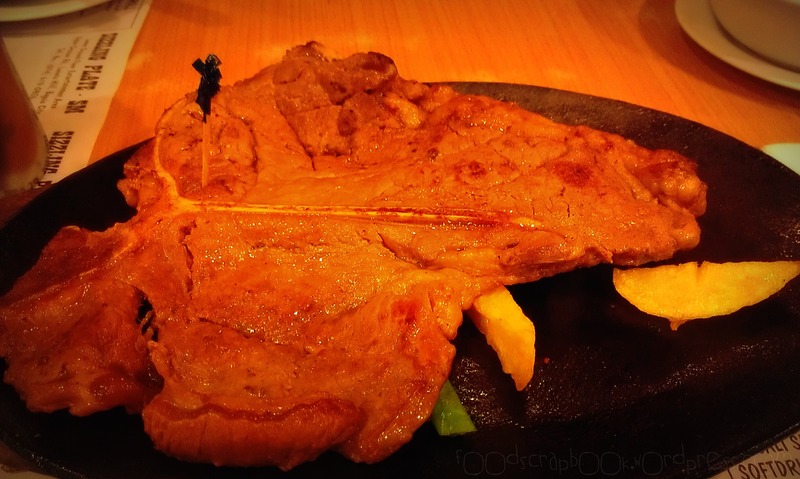 All of their sizzling dishes come with free mushroom soup which is a perfect pair to your steak. We both had Tenderloin Steak served two ways. One is the classic cut.. This time with gravy (yum!). I had this medium cooked because I don’t want my beef all dried up. 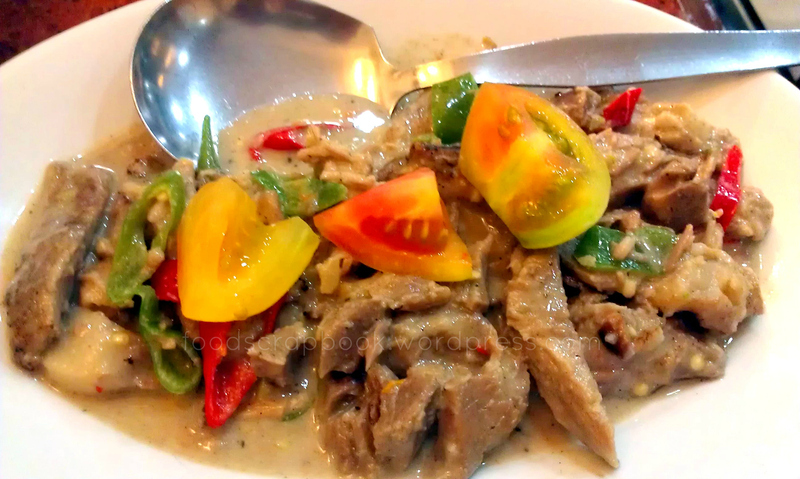 another is called Tenderloin Bits where it’s cut into smaller pieces and served with veggies (excuse the blurry photo).. 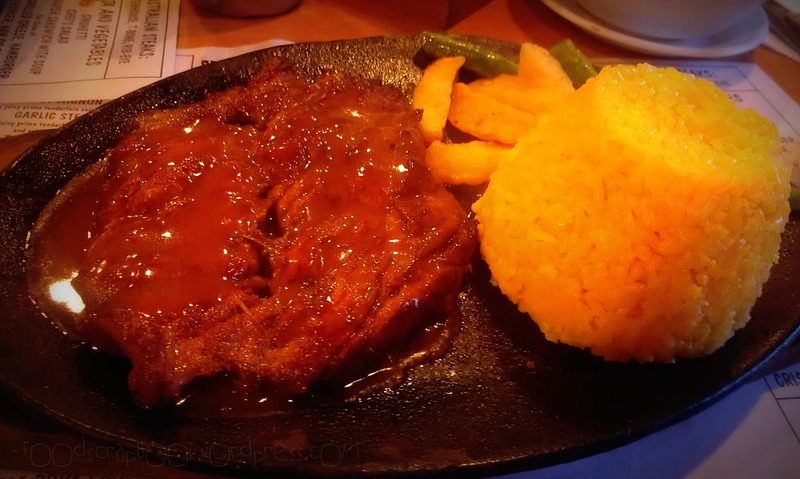 It was really good and a very nice way to heat up in the cold Baguio climate. We loved this restaurant so much that we went back the following day. This time, we had a different set of orders. I went for their Australian Beef Porterhouse Steak and I was so happy that it turned out pretty well. The beef was so soft and fresh. A true Australian quality beef! We also had their Salisbury Steak which was definitely yummy. 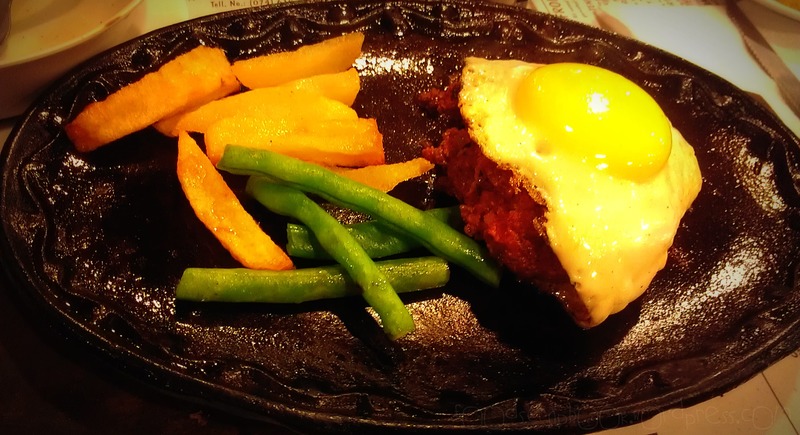 It even tasted better with that egg on top (sorry, the egg is covering the pattie..). 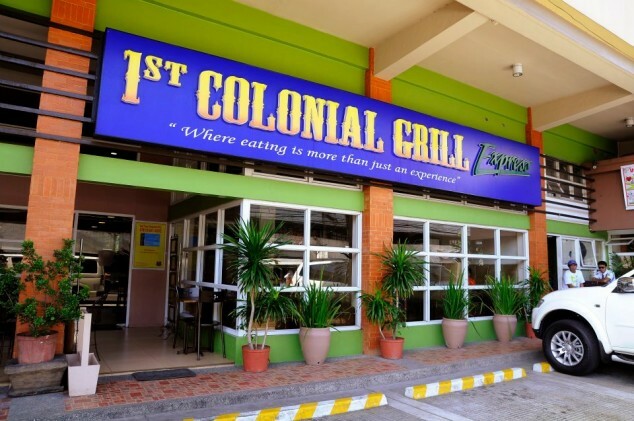 You’ll never go wrong here because they serve the freshest and finest choice of meat cuts everyday. Value for money is fair enough since their food prices range from just 100+ up to 200+ per meal. Their Australian Beef servings usually cost 200+. 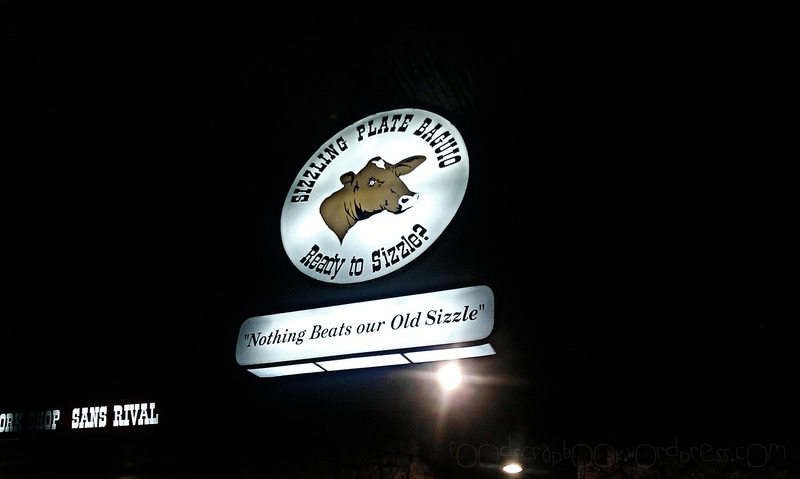 Sizzling Plate Baguio has three branches and my favorite is the one in Abanao Extension, Cariño Street. There’s also one along Session Road and another in SM City Baguio. 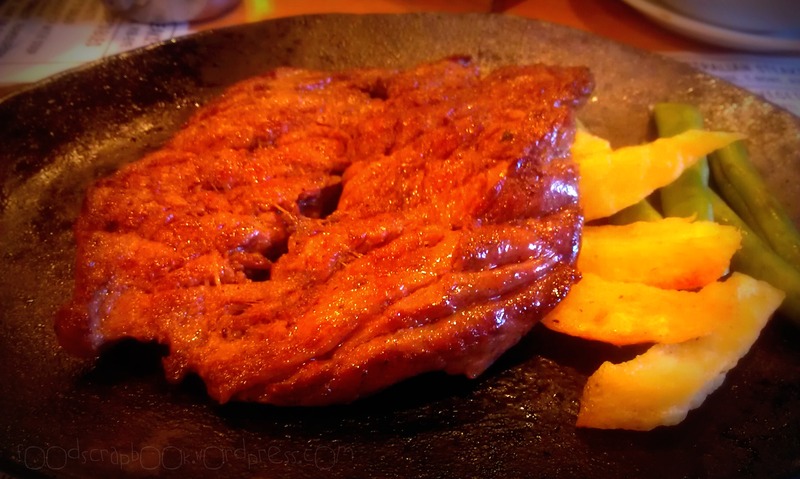 I had a bit of a bad experience with the one in Session Road because the staff wasn’t very accommodating and they served me with chewy steak. Because of that, we said that we’ll always go to their biggest branch in Abanao. 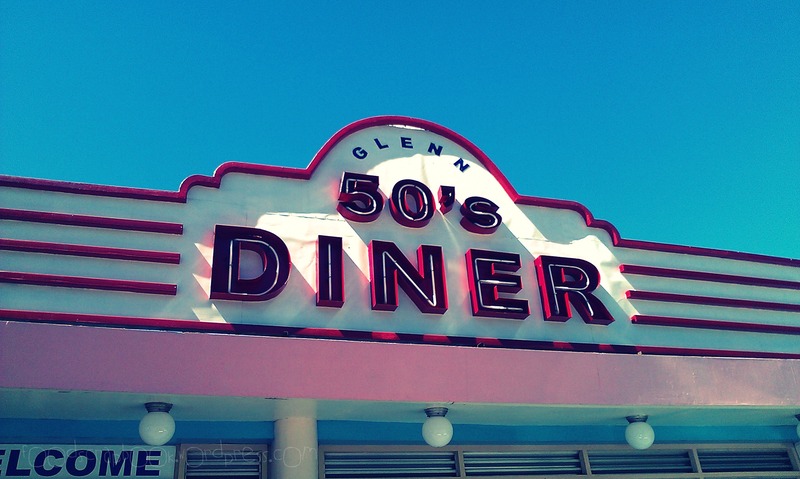 Glenn’s 50’s Diner marked our first stop as we had our brunch that morning. We arrived in Baguio at around 11 am after 7 hours in the bus and it was too early to check in the hotel so we decided to eat first. 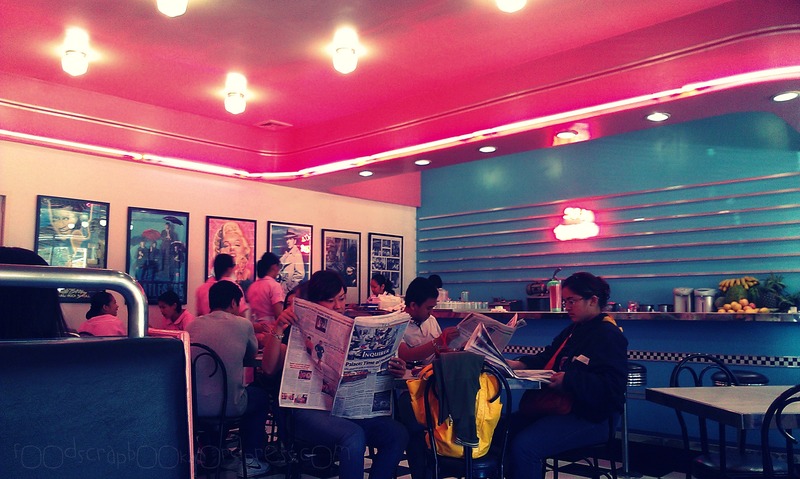 50’s Diner is one of our many favorite restaurants in Baguio so we never fail to visit each time we’re there. The name itself and the exterior is a major giveaway to what this restaurant is all about. 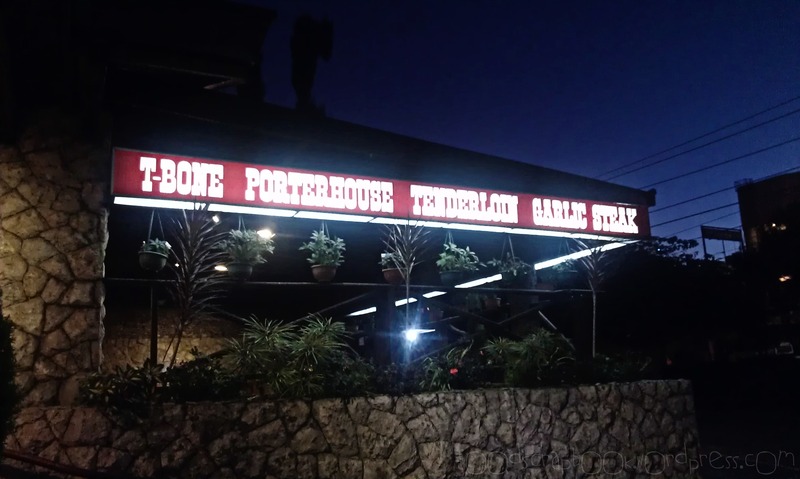 It has been named as one of the famous snack bars/restaurants in Baguio not just because of the way it looks but also because of the delicious yet affordable food they serve. 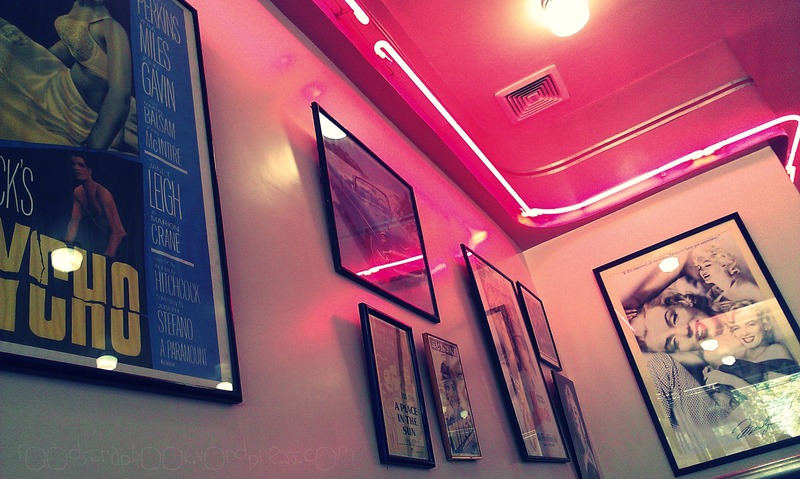 Interior-wise, the place looks very much vintage just like how it looks from the outside. 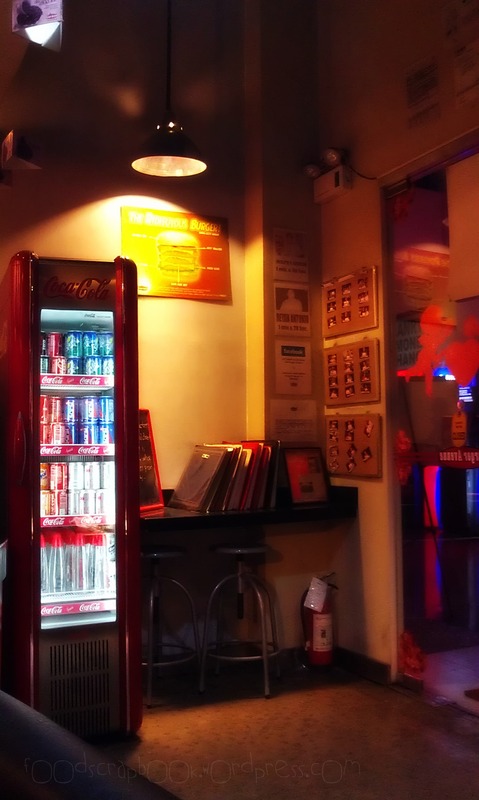 There’s a bar at the side where their famous milkshake or ice cream shake is prepared. 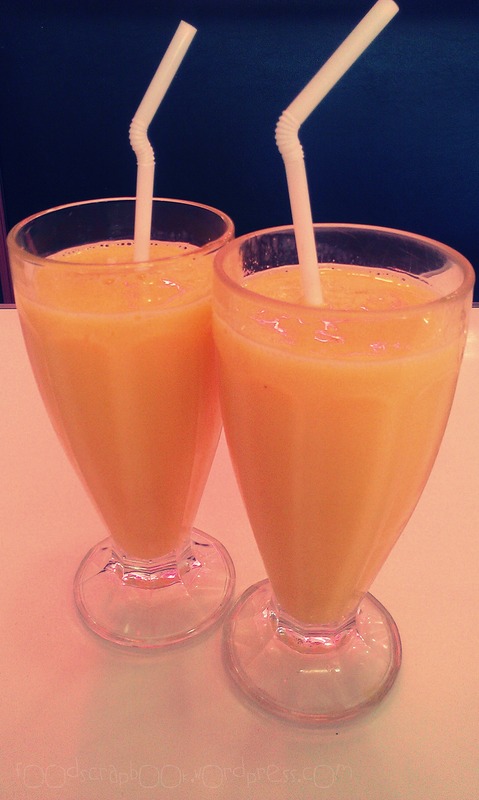 Aside from milkshakes, they also serve fresh fruit shakes and what better way to start the morning with a refreshing Ripe Mango Shake. 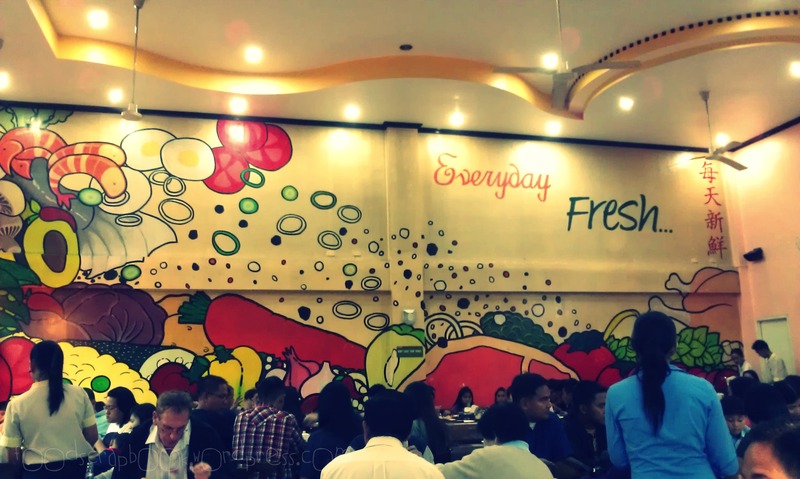 As you wait for your food to be served, you may feast your eyes on the wall decorations and the interior design since you won’t see many of them here in Manila or there in Baguio. Feels like a 50’s flashback you never had! After that fulfilling meal, we were set to conquer the day. haha We just loved the cold summer breeze in Baguio so much that we decided to stay outside of the diner for a while before going back to the hotel. 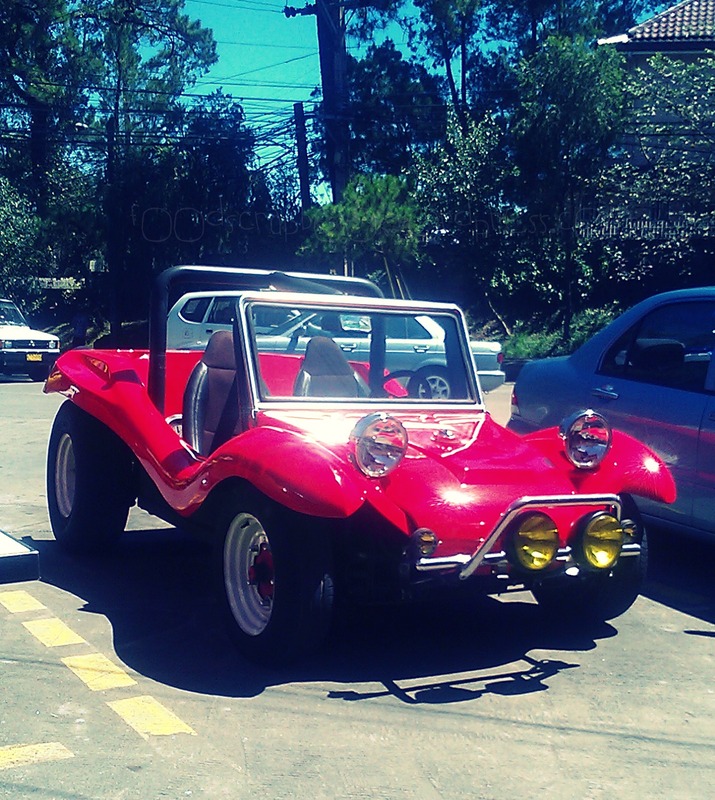 This red vintage car never leaves this spot! Cute right? This is probably owned by Glenn too, who knows. 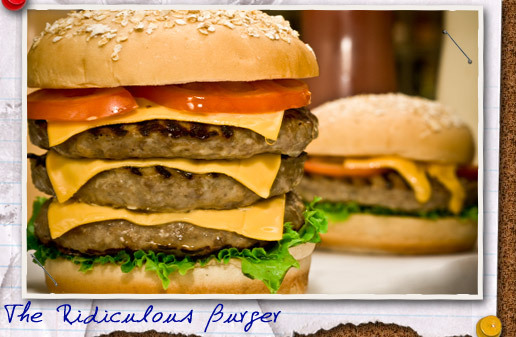 Ridiculous, one word and a rather unusual way to describe food, is a fair enough justification to what Burger Avenue has to offer. A lot of things might come into mind when you say Ridiculous Burger but the real deal about it is what makes it unique in it’s own way. What is the Ridiculous Burger? Freshly grilled ALL beef triple patty sandwiched on an oatmeal bun laced with crisp lettuce, juicy tomatoes and three cheese slices. The challenge? Finish it all up in 5 minutes and it’s FREE! This might sound like an amazing deal but wait till you actually try the challenge. I haven’t done it myself because I know for sure that I won’t be able to pull it off but I’ve seen some who did and you can just see the pain in their faces as they race through time trying to prove themselves. Kudos! to those who were able to win it especially those who did it in only a minute or so (talk about skills!). Aside from the famous Ridiculous Burger, most of the other burgers that we tried were really good. We love this place because they are open until past midnight and it’s perfect for after those stressful long nights in the office when most of the other good restaurants are already closed. 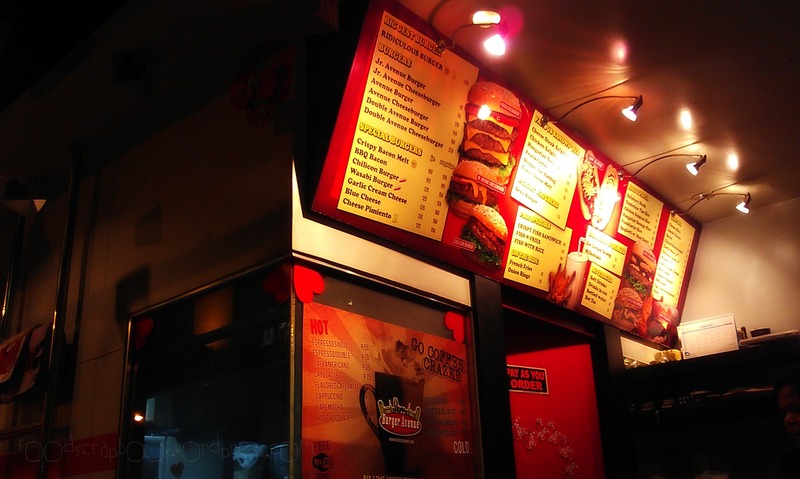 They have a wide assortment of burger and sandwich creations in their menu which I’m sure are all good to try. 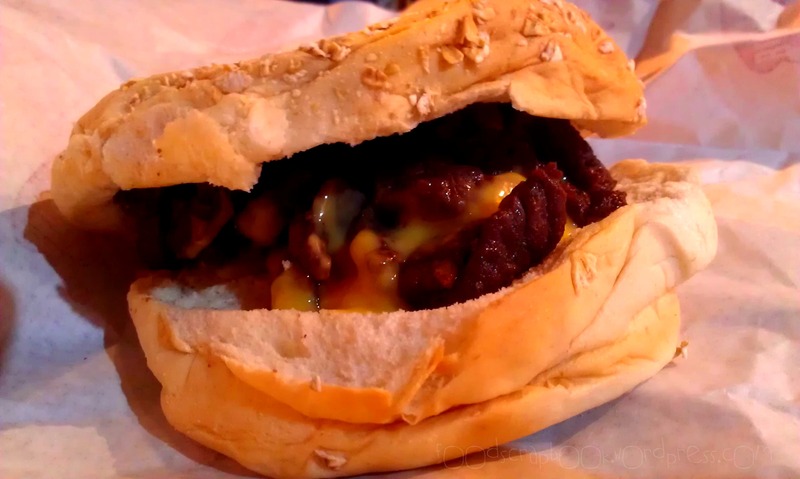 and the Cheese Steak Salpicao Sandwich, which is their version of the Cheese Steak and Beef Salpicao combined. This one is really good and I recommend this one as a must try! 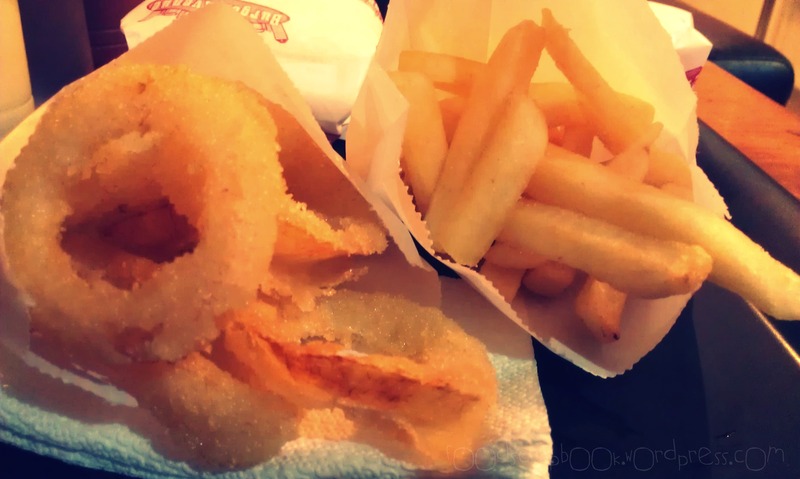 Both of these delicious sandwiches were paired with the best burger buddies in the world, Fries and Onion Rings! 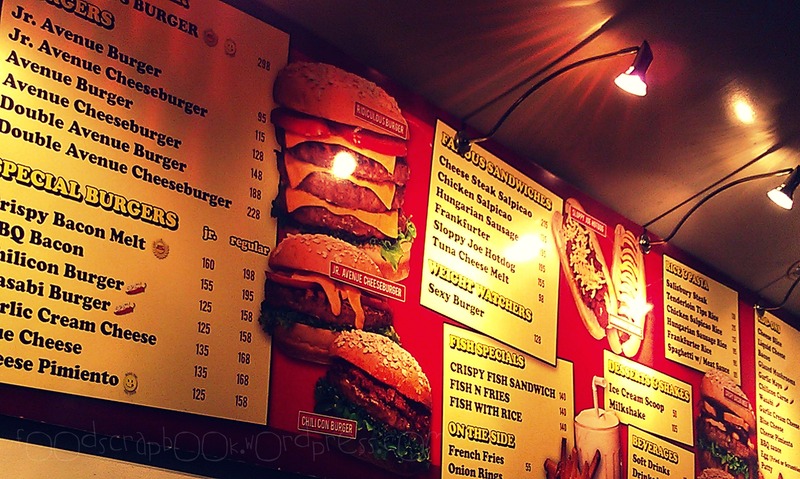 Value for money is great and they have Jr. and Regular sizes for some burgers. 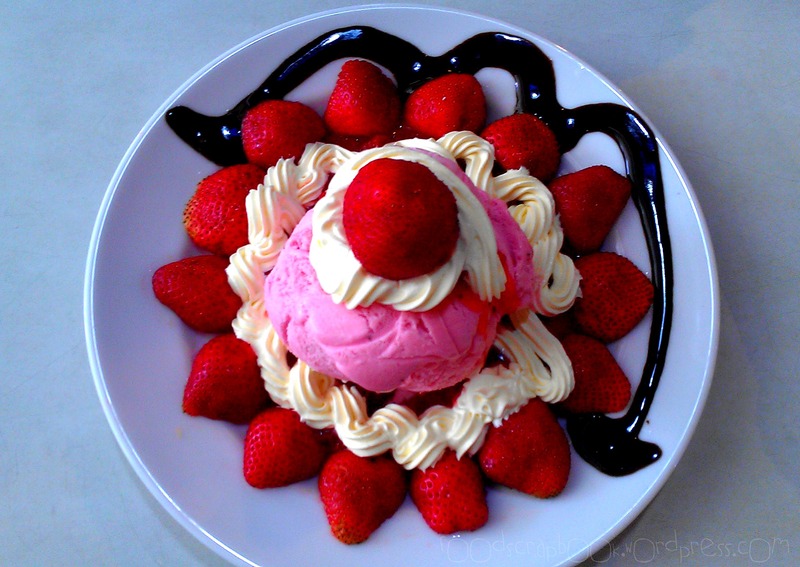 This gives you the option to go for the portion that suits you best so that you’re not bitin or you don’t overeat as well. Here we have their sort of wall of fame for those brave souls that won the Ridiculous Challenge. You can see the photos posted in the corner. 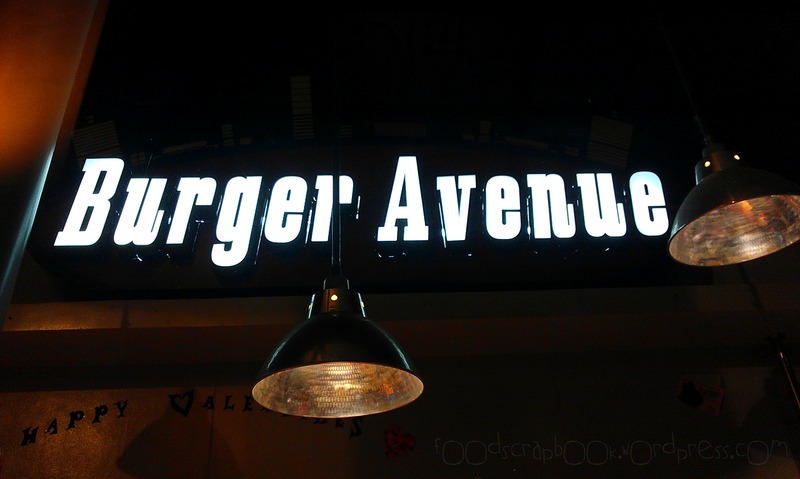 Burger Avenue is located in The A Venue Mall along Makati Avenue and in the Fort Strip in Bonifacio Global City. For delivery, call 729-91-08. See terms in their website.